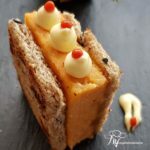 It’s time to think about the first canapés for Christmas! 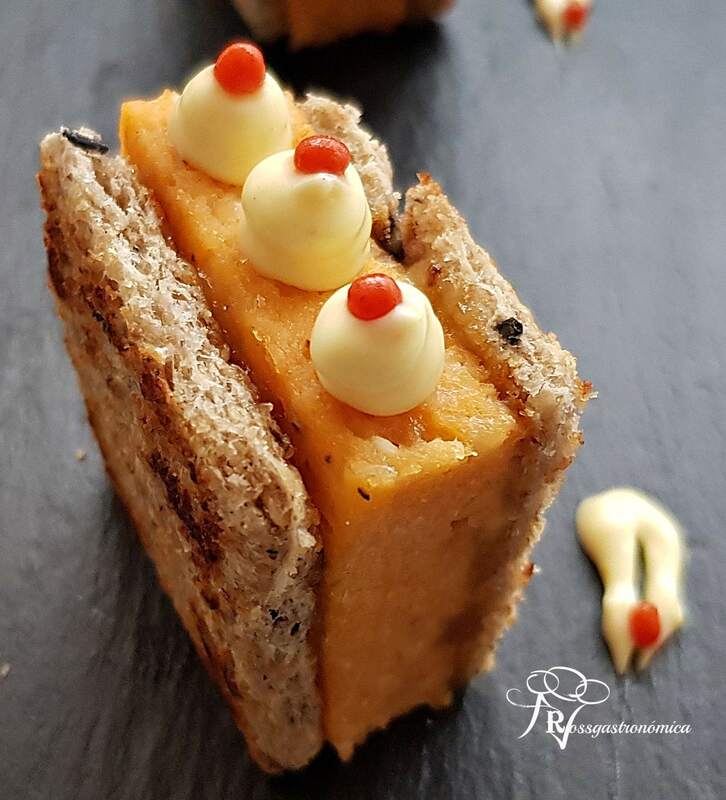 This time, Rosalía at Rossgastronómica has prepared a tuna pudding mini sandwich that is delicious. Put the drained tuna (keep the oil), boiled egg, tomato sauce, and bread crumbs in a container. Mash together until the mixture becomes a smooth cream without lumps. Put aside. Whisk together the 2 raw eggs, a little salt and pepper and the Creme Fraiche. Put aside. In a large bowl, combine the two mixtures, mix and add the grated cheese. Stir to blend all the ingredients. Adjust salt if required. Pour the dough into a microwave-safe mould (silicone or glass). If using a silicone mould, insert the dough directly without oiling the mould. If using a glass mould, lightly oil the interior in order to make removing it easier. Once the dough is in the chosen mould, cover with transparent film and cook in the microwave for 7 minutes at maximum power (800 w). After cooking, turn off the oven and leave the pudding inside to cool. Flatten the bread slices with a rolling pin and cut into 4 equal squares. Toast them in a frying pan with a few drops of the olive oil from the tuna. Cut pudding squares the same size as the bread. Spread a little onion marmalade on the inside of the bread and insert a pudding square between them. The marmalade acts like a glue and holds the pudding together. Mix the mayonnaise with the mustard and put three dots of this mixture on each sandwich. Topped with three pearls of smoked paprika. Crunchy on the outside, creamy on the inside. A delicious snack. Thank you, Rosalia!